Security and Error detection are the most prominent features that are to be provided by any application which transfers data from one end to the other end. One of such a mechanism in tracking errors which may add up to the original data during transfer is known as Stuffing. It is of two types namely Bit Stuffing and the other Character Stuffing. 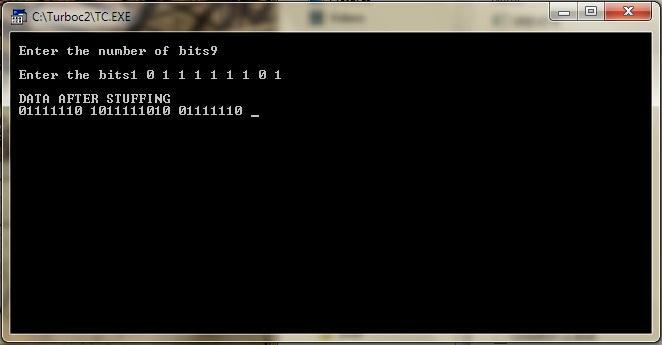 Coming to the Bit Stuffing, 01111110 is appended within the original data while transfer of it. The following program describes how it is stuffed at the sender end and de-stuffed at the reciever end. Bangalore web Zone is a web site design and website development company with considerable knowledge in developing web-site and using powerful digital marketing & enterprise growth strategies for our customers.We’re professionals when it comes to marketing and advertising and technology but more important we’re zealous about using our knowledge to make your brand much better.